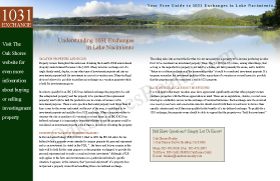 Oakshores Realty understands the complexity of 1031 Exchange in Lake Nacimiento. That’s why they have developed an exclusive and complimentary 1031 Exchange Guide. Simply enter your contact information below and a Free 1031 Exchange Guide will be sent directly to your inbox.